At the end of November 2016, I decided to restart Kyria's restoration after a break of around 20 years. It felt like a lifetime ago when I had done all that work to her the first time around. I had often planned to restart, but between work and family life I never seemed to have the time......until now! If you haven't read about the first phase of Kyria's restoration, it would be a good idea to at least look through the photos here (and read the text if you have the time!) 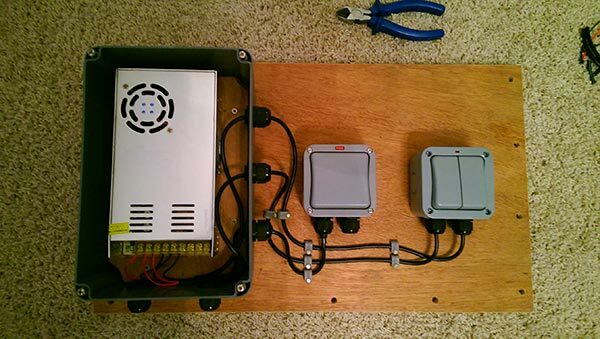 to get aquainted with the work I did previously. 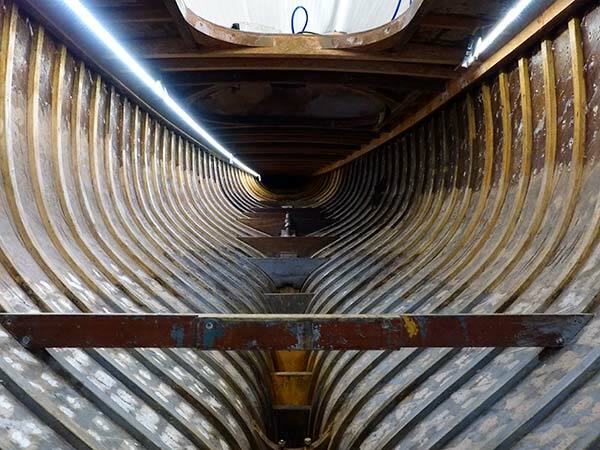 I'm pleased to say that there was absolutely no movement whatsoever in the hull planking (I had previously removed the outer skin and bonded it to the inner skin with WEST System epoxy) - none of the seams had opened up at all and the epoxy had done its job in keeping out any moisture. 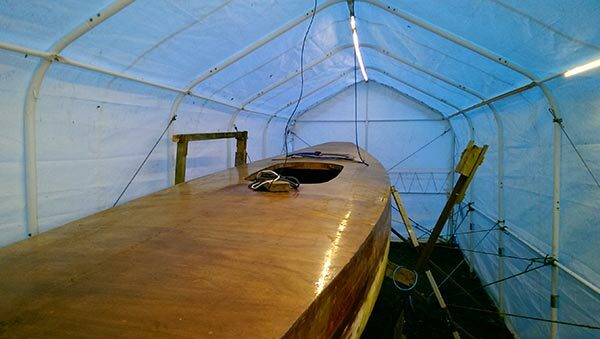 The only change was some UV degradation of the fairing compound that I had applied to the exterior of the planking and also similar degradation of the epoxy coating on the ply subdeck. Even though she was covered over, there was still enough sunlight getting through to degrade the epoxy over such a long period of time. 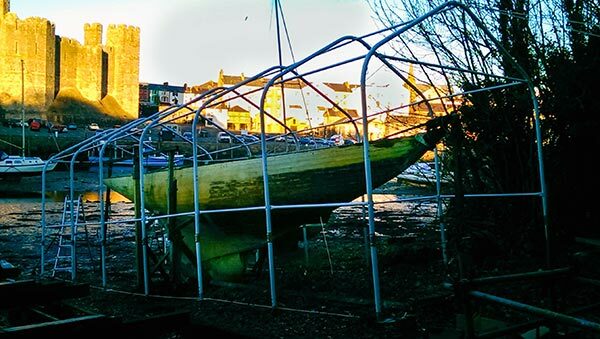 There was some seawater in the bilge after the recent spring tides. 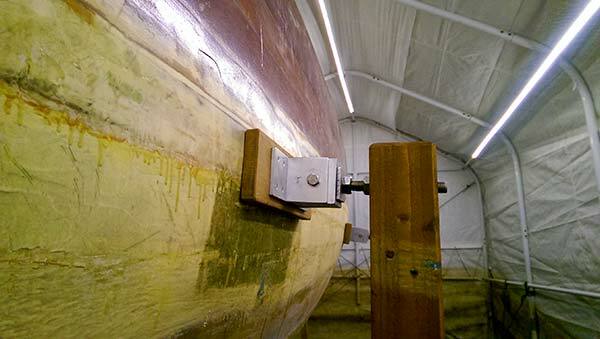 Clearly the joint between the wood keel and ballast keel was leaking. The water had corroded the steel lifting eyes fixed to the keel and the rust had turned the water a horrible murky orange colour, which had stained the inner planking. 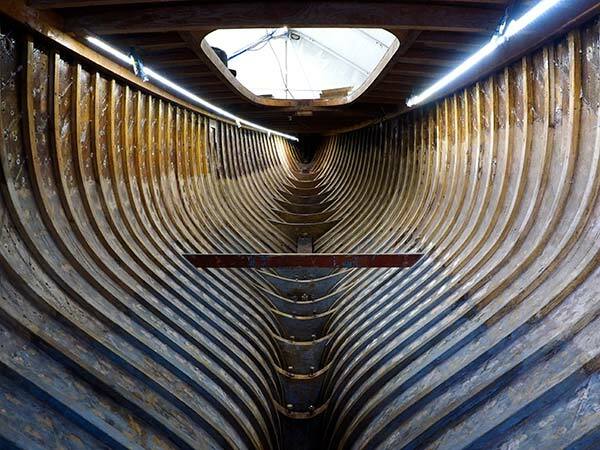 The first job was to empty the bilge out and clean it up as best I could. 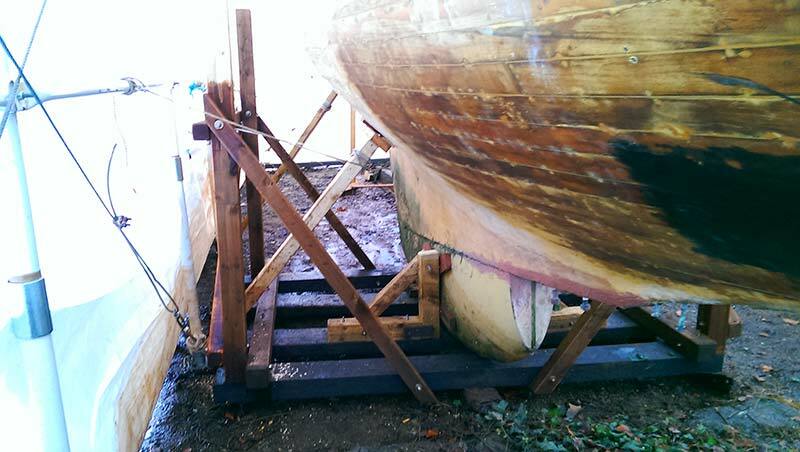 I would later temporarily seal the keel/ballast joint with some sealant to keep her dry during the big spring tides. Fortunately there was no sign of any rot or softness where the water had been lying (it was primarily saltwater, which helped). I knew that in order to have a suitable environment to work on Kyria I would need to build some sort of shelter over her. Initially I was going to build it myself, which would have consisted of a timber frame with a canvas cover over it. I also started looking on a certain well known auction site in case any suitable shelters came up for sale. 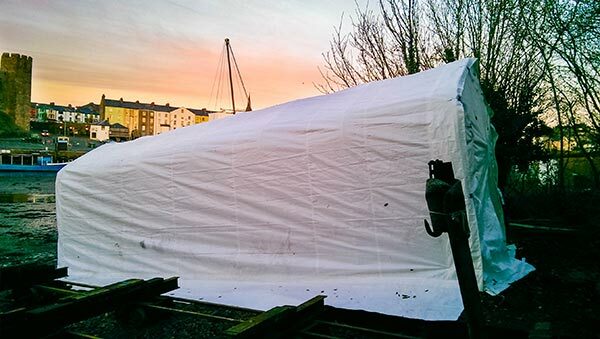 After searching for a week or so I stumbled upon an advert on Gumtree for a second-hand shelter that seemed to have ideal dimensions for what I needed and the price was reasonable (probably cheaper than I could have built one myself, once you included the price of a cover). The only catch was that it was down in Poole in Dorset, some 330 miles away, and I would need a large van to fetch it. I made an offer for the shelter, taking the cost of hiring a van into consideration, and the offer was accepted. With the deal made, I hired a van and drove down to Poole and back in a day to fetch the shelter (it was a long day!). The only problem was that Kyria was located on a foreshore where there was quite a slope and the ground was uneven, especially at the bow where it rose up due to a concrete ramp. Ignoring the instructions that came with the shelter (which stated that it must be built on solid and level ground! ), I adjusted the length of each of the frame supporting columns to take the uneven ground into consideration. I then proceeded to remove what was left of the frame for the old cover. This included a piece of an old mast that was lashed across the top of two of the cradle uprights. 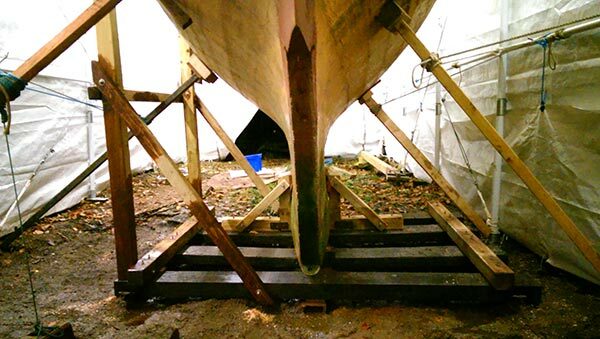 The cradle was built from timber and I knew that it was in bad shape, but I didn't realise how bad until I had removed the piece of mast and it became clear that there was virtually nothing holding one of the cradle uprights on the port side. 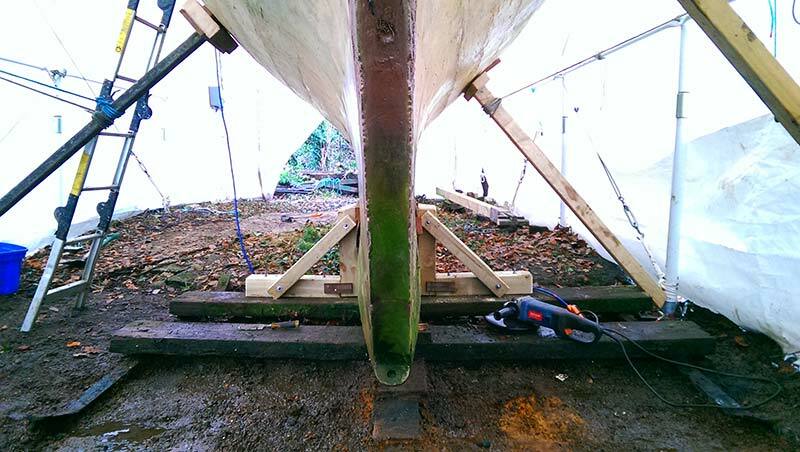 I arranged some temporary shoring to support the hull, and some bracing either side of the ballast keel, then proceeded to remove the rotten parts from the cradle. By the time I had finished there was only the four sleepers that the keel was lying on remaining and two of these would also need replacing! Most of the cradle removed, leaving only two sleepers behind! Feel free to leave a comment below and please share with any friends that might be interested!